LAKE WALES, Fla. — The FBI says they are working with the Lake Wales Police Department and the Polk County Sheriff's Office to investigate reports of explosions at a Lake Wales mall on Sunday night. Initial reports claimed two improvised explosive devices (IEDs) went off at Eagle Ridge Mall on Sunday night, however, Lake Wales Police Department now says the devices were not IEDs or pipe bombs but rather flares disguised with electrical tape. Police have determined there were only two devices ignited in the service corridor where the incident occurred. Police believe the damage to the ceiling of the corridor was caused by the suspect, not an explosion. Police have not determined the motive of the suspect(s) involved in the incident. They have released information on two persons of interest. The first person of interest is described as a white male, middle aged, heavy/stocky build, wearing a grey shirt and grey hat. 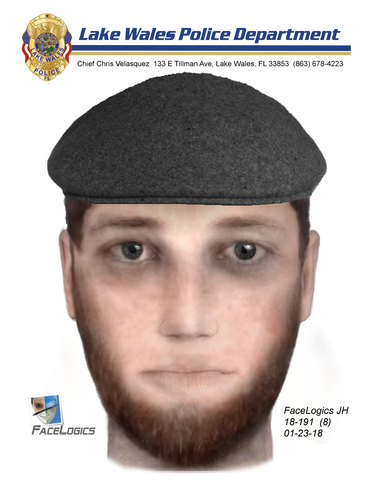 The second person of interest is described as a male, believed to be white, 20 to 40 years of age, wearing a dark colored hat with a jacket and light colored shirt. “They very well may be innocent people, who were just there at the time, and saw something happen, got afraid, and left in a hurry,” Deputy Chief Troy Schulze said. A backpack was also located at the scene but bomb technicians say it did not contain any incendiary or explosive devices. Upon further investigation, the FBI says there is no current indication of any terrorist connection to this incident. Police say the public is safe and the mall is open for business. Schulze said the person or people responsible could be charged with arson to an occupied structure. He said they could face additional charges, depending on their investigation. On Monday, The Eagle Ridge Mall released a statement regarding the incident. The mall plans to open for regular mall business hours on Monday (10 a.m. to 9 p.m.). The mall describes the explosives as two signal flares that triggered a fire alarm in an unoccupied area of the mall. Eagle Ridge Mall says "We are extremely grateful to the first responders and security personnel who acted so quickly to ensure the safety of our guests, tenants and employees. A law enforcement investigation is currently underway to determine the cause of the incident, and Eagle Ridge Mall will assist investigators in any way possible." The mall also says "Initial reports of pipe bombs, IEDs, explosions or detonations of any kind at Eagle Ridge Mall were incorrect, as were reports that any additional dangerous materials were found during a thorough law enforcement search of mall property." The fire department says they located two pipe bomb type devices, later determined by the FBI to be marine flares, that ignited in the corridor of the building. They also located a backpack in the same corridor. Officials initially reported that the backpack contained possible improvised explosive devices in it, the FBI confirmed it did not have explosive devices inside. No one was injured as a result of the explosion, but the ceiling and corridor wall did sustain damage. At 5:30 p.m. on Sunday the Lake Wales Police Department responded to begin a criminal investigation. The mall was evacuated. The Polk County Sheriff’s Office, the State Fire Marshall, and the Hillsborough Sheriff’s Office Bomb Squad all responded to assist in the investigation. "I’m grateful for Florida’s first responders and law enforcement who are working to keep everyone safe in Lake Wales tonight," Florida Governor Rick Scott said on Twitter late Sunday night following the incident. Anyone with information on this incident is urged to contact Lake Wales Police Detective Whitney Dukes at (863)678-4223 or Heartland Crime Stoppers at (800) 226-8477.